"Does it come in black?" Chuck Norris destroyed the periodic table. Because he only recognizes the element of surprise. You're the man , I'm the King. I recommend you do some research and decide what's best for you. Feel free to provide more info as to what exactly you are looking for. Or you can search the myriad of threads on this forum that cover the subject, extensively. Mr. I am the night. Optional signature you may use to appear at bottom of your posts. Why don't you tell us a few of the tactical knives you personally have actually used in real situations? Been over that already on this forum, try actually reading what people post from time to time. Refresh our memories then, and it would be helpful if you could describe some of the actual situations you used them in. Still waiting for some indication you have EVER set foot outside. I recommend my EDC knife, the Cold Steel Spartan. Although I haven't had to use it in a threatening encounter myself, I have read reviews of the knife online where the reviewer states that it has deescalated the situation rapidly. 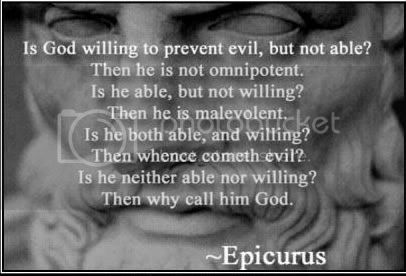 However, I would never count on this - in my mind, a weapon always escalates the level of violence someone is willing to put forth against you. However you still need to get to your weapon because the enemy may be armed. To be honest I'm a bit confused as to what I think about this myself, but the point is I'm careful and don't flash my blade at the slightest sign of trouble. I carry this and whether I will use it will be decided by my feeling of need then and there. The reason I love the Spartan is the S-curved blade like a small kukri or kopis. It has a very secure grip with a good pommel you could strike with. It's a huge folder, so it's scary yet easy to hide. For another big folder from the same guys, I could recommend you the Rajah II, but I won't. The reason is that after a fair bit of chopping with it, it closed on my hand and cut my fingers. One failure is way too many - I'm glad it wasn't in a life-or-death situation. That's my recommendation. Now, tell me, what are you looking for in a tactical blade? Will you be carrying it every day? Does it need to be concealable? Any laws at your location outlawing certain blades? Just post all you can think of about you and the perfect knife. "In all countries where personal freedom is valued, however much each individual may rely on legal redress, the right of each to carry arms - and these the best and the sharpest - for his own protection in case of extremity, is a right of nature indelible and irrepressible, and the more it is sought to be repressed the more it will recur." Exactly why my EDC is a FIXED BLADE! 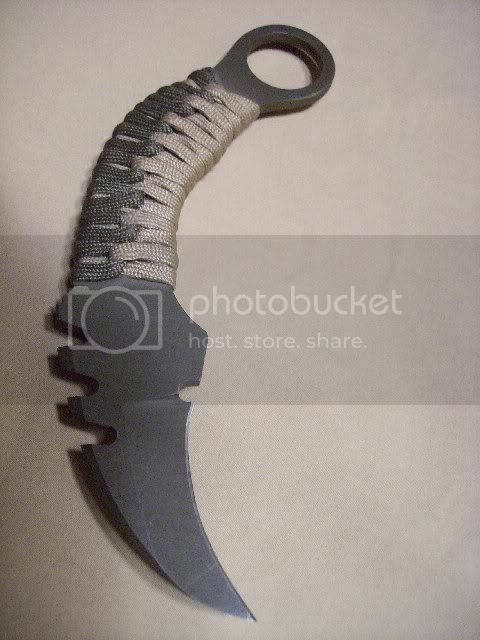 Nice karambit, how much and who made it? I got a very cheap karambit a few months ago that's actually meant to be a tool knife, from Mora Sweden. 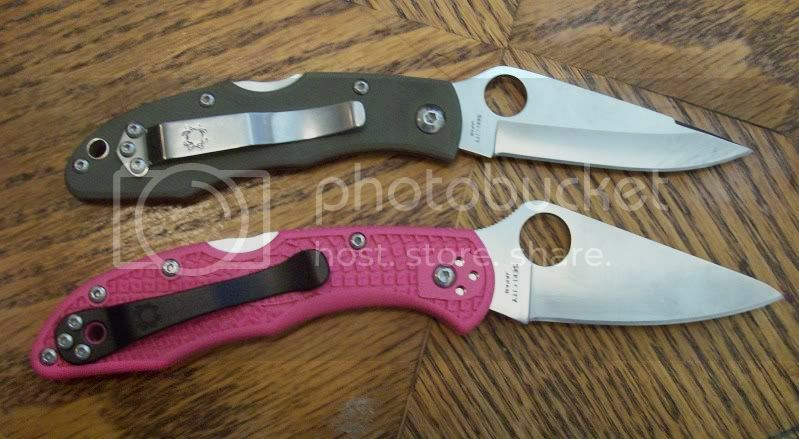 It's pretty sweet if you don't need the pinky ring, or if you want a nice blade modify. 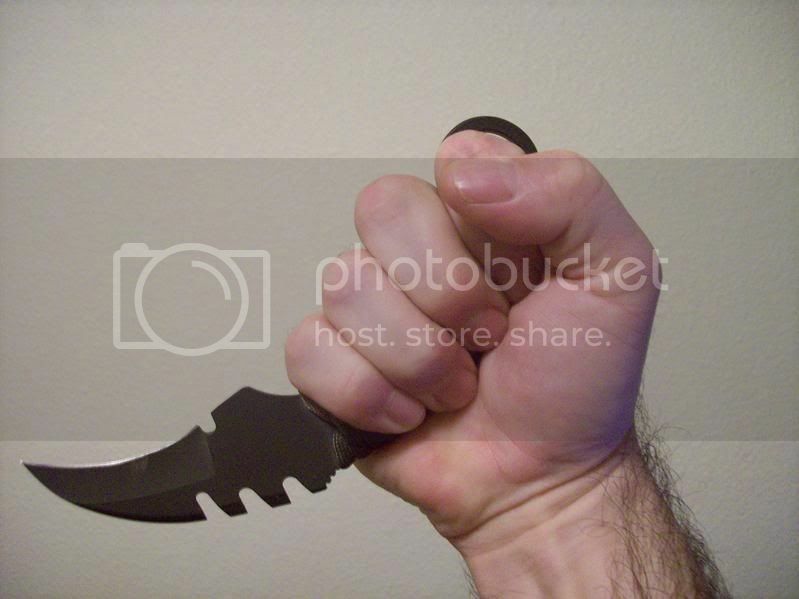 It's a custom of my own design based on traditional karambits. A knife maker in Texas hooked me up with two prototypes for a very reasonable price. A hooked blade is typically used in the flooring industry. (Carpet and linoleum, also roofing) ) It's not really a karambit without the (index finger) ring and a hooked blade. Frankly I'm glad you didn't sever your fingers (OFF) with that CS POS. I'll ad your fine example of folder failure to my list of reasons I WON'T recommend folders (or Cold Steel) for any serious tactical use. I have a modest collection of inexpensive spiderco knives but mostly I give them away to my friends. If I think of "tactical" I'm going with something I trust 100% to do a particular task. If that task is intentionally lethal I'll go with a Ka-Bar big brother or some other equally reliable fighter, bowie or drop point style blade. Don't overlook double edge blades like the Fairbairn fighter dagger or smatchet. After many years of playing and working with uncounted knives I've evolved to appreciate a small hooked blade with a ring. "In close-quarters fighting there is no more deadly weapon than the knife. In choosing a knife there are two important factors to bear in mind: balance and keenness. The hilt should fit easily in your hand, and the blade should not be so heavy that it tends to drag the hilt from your fingers in a loose grip. It is essential that the blade have a sharp stabbing point and good cutting edges, because an artery torn through (as against a clean cut) tends to contract and stop the bleeding. If a main artery is cleanly severed, the wounded man will quickly lose consciousness and die." Some copies of the famous knife have been made by Gerber (Mark II) and have a similar reputation for reliability and purpose specific function. I'll take any old pig sticker. It's really not so much about the tool as the hand of the man wielding it. All times are GMT-6. This page was generated at 12:16 AM.